Every now and then, when passing through the little-used side yard at my house, I would look up and notice a couple of over-sized openings where the utilities feed into the soffit. “Boy,” I’d say to myself, “I need to spray some foam sealant up there to keep the squirrels out,” but there always seemed to be a higher priority, so I’d vow to get around to it soon. I wouldn’t. I would forget about it until the next time I noticed it. Finally, the gods decided to punish me for my procrastination and carelessness. One wintery night, my wife and I were awakened by the sounds of movement in the ceiling above our bed: scratch. Bu-dump, bu-dump, bu-dump. The sound of acorns rolling. The dog started barking. The invasion had begun. Suddenly a man of action after failing to administer an ounce of prevention for months, I rushed right out to buy a pound of cure: a squirrel trap, critter repellent and mothballs. Without any further research on the matter, I stuffed a pouch of mothballs in each soffit opening to smoke the squirrels out for a while. Thus a problem became a fiasco. A couple of hours later, my wife went to our bedroom, which is just inside from the soffit openings. She could smell the mothballs, and was less than delighted. The vapor must have seeped inside the house through the wood and sheetrock. Realizing my error, I rushed out to remove the pouches. One of them ripped. Mothballs rolled around inside the soffit. My wife slept on the sofa for the next couple of nights. The squirrels were gone, but I spent the next two weeks trying to get rid of the smell. I scoured the inside of the soffit for the remaining mothballs. I spent hours scrubbing the walls and ceiling of the bedroom with vinegar, then bleach. I bought activated charcoal, lava rocks, lavender and some mystery powder off the internet. I burned candles. I sprayed sprays. I opened fragrance cans. I plugged in a deodorizer. I put out coffee grounds. I made my own proprietary blend of alcohol and essential oils and put it in a spray bottle. It culminated in borrowing a box fan to blow in fresh air, and a friend suggested ripping out sections of soffit to let it air out. He did that, and I pulled out the insulation as well. My father in law, an old shipping merchant, told us that in Colombia containers are deodorized by burning coffee beans inside them. The combination of fresh air and coffee-bean-smoke worked best. Since then, I’ve been administering pounds of prevention around the house. A gardener trimmed up the holly bush, which had grown directly against the house, posing a potential moisture hazard. While he was at it, he trimmed the ginger way back; my mother-in-law once told me ginger attracts rodents. Check. After the trimming, I got a good view of the exposed water pipe on the exterior of my house. In a good freeze, it could burst, if not wrapped. Check. One project I had been procrastinating over for years was the removal of an oak tree that had grown from a neighbor’s yard to hang almost entirely over my roof. This not only posed the risk of roof damage in a storm, it also provided a highway for squirrels, raccoons and possums, all of which I’ve seen in my yard. Today, that tree is gone. Check. Now to repair the deconstructed soffit and seal it off, once and for all. I’ll get around to it soon. 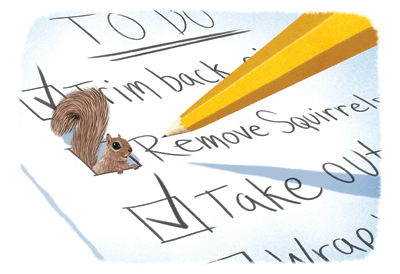 Seal any holes or openings that can provide access to squirrels, rodents, possums or other critters. Don’t allow pine needles, leaves or other debris to build up in the yard. To cut down on mosquitos, remove any receptacles where standing water can accumulate. Regularly service HVAC system and change filters. If you have a chimney, keep it clean. Repair deteriorated grout lines in tiled areas.